ESCHATOLOGIA: Elder Porphyrios: "I Don't Like To Prophesy"
It must especially puzzle us why the Elder didn't speak at all about what is coming, but only revealed what was necessarily required for certain people. The core thought of Elder Porphyrios was that people need to consolidate and grow in love towards their Creator, not through fear of things to come, but through a selfless relationship, as an affectionate father towards his child. Because the unity that was the greatest legacy of Christ to His Apostles, can be ensured when the child is joined with his Father primarily through love and not fear. Elder Porphyrios aptly likened the times we live in to the years just before Jesus came. What existed then? A Roman "peace" in power and idolatry, and a priesthood alienated by the passion for power that was hypocritical without being beneficial, but rather distanced the people from God. And finally there was a small portion of pure and good people. All this describes in detail what is going on today, and the repetition of this in our era should probably strongly trouble us. Before Christ there existed prophecies about His coming as well as warnings for repentance to the people of God, as in the case of Jonah and Ninevah. However, these prophecies were sent by God for those few good and pure people of each era, as I said before, because they had the goodwill to receive the messages and know what to do. Elder Porphyrios acted with this in mind, calling people to approach Christ with love and not the fear of terrible events. He knew but he did not say. He spoke laconically and in codes, understanding that in our era there was a great gap between the spirituality of people on Mount Athos with the outside world. For this reason he sent a man to notify Elder Paisios to stop speaking about the Antichrist, the mark, imminent wars, etc. Not because it was wrong that which was informed to Elder Paisios through Divine Illumination, but because the spiritual measure of the world is at such a level that fear has no practical effect and that the only approach needed was love for Christ. For if man loved God, then God, when people change, will change history. The same happened with the imminent destruction of Ninevah. The same Elder Porphyrios, during his last days, stressed the moral degradation and misery which we find ourselves in as people, and stressed to his spiritual children to find a verse in the Old Testament that says "You have a cloak, you be our leader" (Is. 3:6). There we were told describes clearly the current situation. The same situations of "old Israel" with the "new Israel" and the same symptoms. The "old Israel" lost its unity with God and the "new Israel" lost exactly this path of unity with Christ. This was the great longing of the Elder and he served it literally till his last breath. The Hierarchical Prayer of Christ, "that all may be one", was what the Elder served as long as he lived and he slept with it on his lips. Because he knew that when mankind is ensured with unity with Christ, then they will fear neither wars nor the Antichrist. In contrast, today we approach evil and examine those things that are coming as an inevitable evil. Here we lose the entire essence. Wars, calamities and upcoming events are the ultimate remedy to human apostasy, which is why Elder Porphyrios would say: "The Apocalypse was written for it not to happen". The Apocalypse has as its purpose to alert, and the way to avoid it is to serve the unity which Christ left to us as a legacy. This is the therapeutical treatment to the sick, because if the sickness progresses, the events of the Apocalypse will be the amputation caused by the physician when gangrene sets. The Elder would say: "Our time is like the time of Christ. Then the world had reached a terrible state. But God spared us. And now we must not despair. I see through the calamity to appear some very important person of God, who will rally and unite the world for good." It was one of the few occasions when the Elder spoke about that which we are living and is upcoming. He stressed that the justice of God is changing and that our situation is miserable. But he saw that the mercy of God will once again visit mankind. Elder Paisios said the same thing when visitors approached him with evident anxiety about upcoming events and when he was asked when the wrath of God will come. He would say: "We need to ask that His mercy comes, not His wrath." This is what humanity needs and this is how we must approach what the Saints told us. That which was prophesied in our time are for those few who, like before the time of Christ, have the goodwill to serve their unity in Christ. The tabloids, the foreign press, the electronic media channels deal systematically with what Elder Paisios and other contemporary elders said. I don't know if they do it for the sake of advertising, trade, etc. But we must think. We must think to look for the substance in all this. In 2009 while visiting Russia, as part of the effort of issuing the letters of the first Ruler of Greece, Ioannis Kapodistrias, we met with senior officials of the Russian Federation. With surprise I heard a question that relates to all of the above. "Elder George, the fathers of Mount Athos say there will be a war between Russia and Turkey for Constantinople. What do you say about this?" "Saint Kosmas Aitolos, who is a great Saint of Orthodoxy, said: 'They will try to resolve it with the pen, but will not be able to. 99 times with war, and once with the pen.' However, us, we are with the pen," I said. The Greeks I believe had the blessing to be sent by God a revealing personality like Elder Porphyrios to show us the way and the path to avoid calamities and difficulties. It is up to us to manage the legacy he left to us, and not wait for the ship to collide with the iceberg. If each of us acts alone and cut off from Christ, it is certain that we will say that which the Holy Elder said: "He may, however, according to the plan of God, come; to come so that people can acquire an awareness, to see the chaos alive in front of them, and to say: 'Oh, we are falling into chaos, we are being lost. Everyone back, everyone back, turn back, we have been deluded.' And they will return again to the path of God and the Orthodox faith will shine." The last days of Elder Porphyrios were the most revealing for his spiritual children and for all of humanity. The Elder gathered us in his Cell in Kavsokalyvia and told us: "I don't like to prophesy, but I will tell you one prophecy." The Elder told us about what will happen in Greece and what its future will be. It was revealing for the future of Greece. All of these have now begun to be realized. Today we are living all that he told us and began to take place with exactitude. 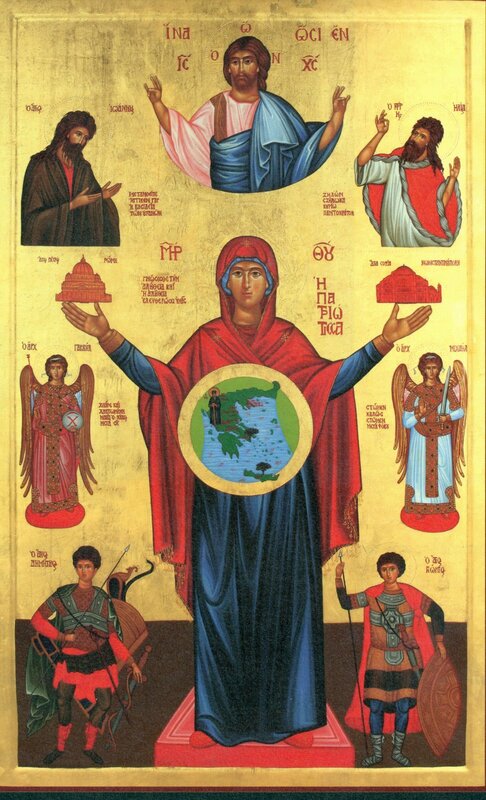 The greatest revelation of God was the last night of his life, when for a half hour he prayed the Hierarchical Prayer of Jesus: "That all may be one". 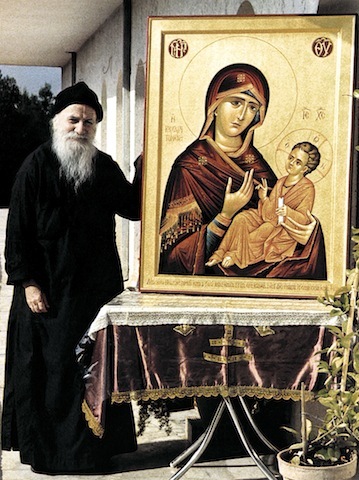 The same Holy Spirit prayed within Elder Porphyrios for the unity in Christ of all Christians and for all of humanity, so that the sufferings of the Apocalypse would not come. This prayer is the greatest legacy of Christ to humanity. May the unity of humanity with God materialize. 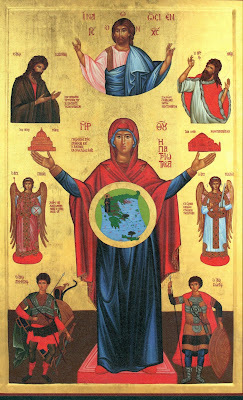 This legacy today, 21 years after the repose of Elder Porphyrios, remains alive and is depicted in an icon: The Panagia "That All May Be One" Patriotissa (below), a prophetic and escatological icon, which all of Christendom knows. We his children serve today this legacy and hope in it.